Summary: Would you be tempted? 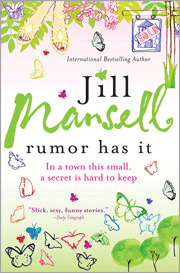 I am a huge fan of Jill Mansell and I just love that Sourcebooks is releasing her books here in the United States. So far I have read three of her books and enjoyed all of them (PERFECT TIMING - review, MILLIE'S FLING - review, and MIRANDA'S BIG MISTAKE -review.) And I recently read a fourth, her the latest one RUMOR HAS IT. I don't read a ton of chick-lit anymore, but I always make an exception for Ms. Mansell! I'm having a hard time writing this review because I feel as if I've already covered pretty much everything in my other three reviews. It's not that I didn't really, really enjoy RUMOR HAS IT. It's just that Ms. Mansell's books tend to follow the same basic format. Girl meets boy and really likes him (and then doesn't), but there are always reasons that they can't get together...until the end of the book. Chick lit at it's best! In the case of RUMOR HAS IT, the girl is named Tilly and after she gets dumped by her boyfriend, she leaves London and heads to the country where her best friend Erin lives. She gets a new job as an assistant to an interior designer -- who just happens to have a teen daughter and is also gay! And she meets the town heart-breaker Jack! Although she is very attracted to Jack (and senses that he feels the same way), she tries to protect herself and keep her distance. It's a very cute, albeit somewhat predictable, love story -- but that's why I read these books. But what I really appreciated about RUMOR HAS IT are all of the terrific supporting characters and side stories. As is the case with every Jill Mansell book, I love that she has so much going on besides the traditional "chick lit" story. And I really appreciate that although the books are light and funny, there always seem to be at least one story with some substance. When I sat down to read RUMOR HAS IT, I was expecting an easy read that would make me laugh. I wasn't disappointed. But I was a little bit surprised by the seriousness (and sadness) of one of the storylines. I don't want to give away too much, but there are a few scenes in this novel which really touched my heart and even gave me a little lump in my throat. I so appreciate how Ms. Mansell is able to balance the mix of chick lit and heartache -- it's one of the reasons to me that her books really set themselves apart in this genre. If you are a fan of chick lit (and especially Brit chick lit) or a fan of Jill Mansell, then you won't want to miss RUMOR HAS IT! I've not read anything by this author, but I have read some British chick lit and really was entertained. I don't think there is anything wrong with a lighter fun read once in awhile - it is good to lift your spirits! I love Jill Mansell's characters and think her books are perfect beach reads. Great review! Terrific review! One of my girlfriends would just love this book, so I'm going to buy it for her so she can take it on vacation in June. Thanks! I've never heard of her, but I'm putting this on hold at the library. (Of course, I was there earlier this morning and had four, count 'em four holds -- plus I snagged the newest Nora Roberts in the "brides" series and am ecstatic. I like Nora for the same reason (among others) that you mention -- it's not just the love story. There are other things going on as well. And boy, can that woman spin a story! As I said, I'm pretty excited that I managed to get the "Hot Reads" copy (which is first-come, first-served. I'm guessing that puppy went on the shelf last night!) Anyway, I'm looking forward to cracking open Nora later today. A romance will be just the antidote to my most recent read, a thriller involving medical terrorism, called "The Ovary Wars." What a concept, huh? Women are being unknowingly sterilized, leading to US economic collapse, because no babies are being born. Throw in some ruthless types, the FBI and baby selling plus some other great twists and you have a thought-provoking book on what could be a new form of warfare. Well, despite the new Elizabeth George I have, despite the new Nora Roberts, despite the advance copy of Anna Quindlen's new book that our librarian just called and offered to me (I'm on the list) and a whole long list of reserves, I reserved this one too! Thanks for the suggestion. I don't read a lot of this genre, but I do enjoy some lighter reading in the summer months -- I'll keep Mansell's books in mind. I love her books too! Can't wait to read this one! I am a big fan of "Brit Chick Lit" so I am looking forward to this one! Thanks for the review! I just love Mansell's books. I think they are fantastic. I cannot wait to read this one!